When completed, the 300 MW Blackspring Ridge Wind Project, located in Vulcan County, Alberta (50 km north of Lethbridge), will be the largest wind project in Western Canada. EDF EN Canada and Enbridge will each own 50 percent of the project. The project represents the largest investment in wind energy in the province at approximately $0.6 billion. The project, which is currently in construction, will be comprised of 166 Vestas V100-1.8 MW wind tur-bines and will reach commissioning in mid-summer 2014. The scope of work on this project was to provide a design build service for helical pile foundations for the project’s substation equipment. The foundations for equipment were originally designed for a mix of cast-in-place and augercast foundations. While some structures remained with cast-in-place foundations, all of the foundations originally designated for augercast foundations were redesigned for helical piles. Cost, installation time, sequencing, weather, no concrete and flexibility with installation equipment were some of the main factors considered for choosing helical piles. Western Pacific Enterprises GP was sub contracted to construct the substation by Mortenson the General Contractor for the project. IDL Projects of B.C., was contracted by Western Pacific for the civil and foundation work. 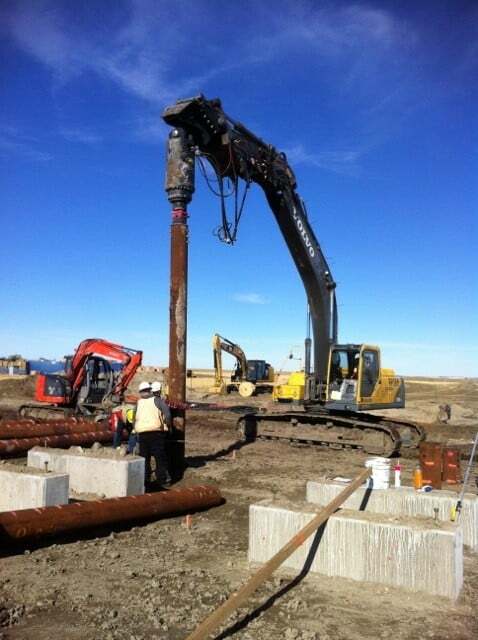 IDEAL also designed all of the pile connection arrangements for all equipment and structures to be installed on the piles. The pile design had to account for high lateral loads and bending loads. The structures to be erected on the piles varied from lightning masts, dead end monopoles, overhead bus equipment and capacitors, to name a few. 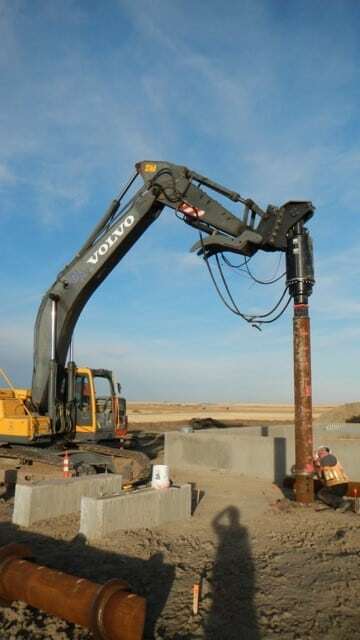 Two pile shaft sizes were selected, 7” and 13 3/8”, with a combination of single or double 24” and 30” diameter helices. The soils conditions at site, were soft silty clays to stiff clay, gravels, over clay till, at 20 – 30 feet. Vertical and compression design loads varied from 20 kips to 168 kips per pile. The attachment of structures to piles was by way of steel plates and steel grillages which were either bolted or field-welded to piles. No concrete was required for any of the attachments. 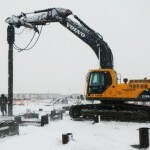 • Piles were installed using a 170,000 foot pound drive head mounted on a Volvo 290 excavator. • Installation tolerance of 6mm for plates and grillages. 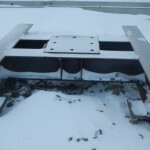 • During the installation of piles, pile caps, and grillages, temperatures dipped down to -35 C.